One of the more noticeable paradigm shifts in the last year for Search Marketing is the process of creating personas for your site users. I must say that this move from keyword obsession to writing useful content for targeted user segments is a move in the right direction. However, the questions remain: how the hell do we cipher through demographic data, what should we determine from this data and what tools will tell us this info? An interesting point is that truly understanding your digital audience will involve focus groups and interviews with customers and internal team members, but a dive into analytics can help tell you quite a bit about the different users on your site. This analysis will allow you to create digital personas for your audience. Before we can create digital personas, we have to grant Google the appropriate access to your site. 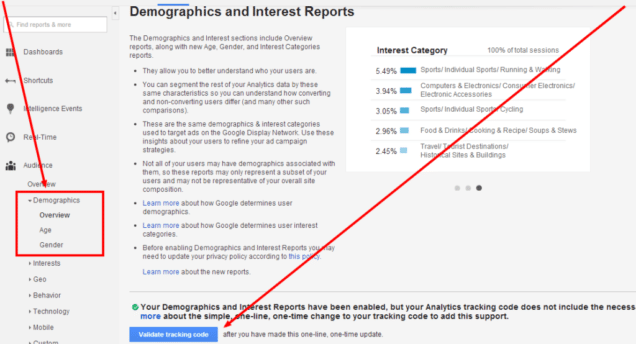 If you have not done this yet, you will see the screen below when you view the Demographics section of Google Analytics. This is noting the offering of demographic data, but you must make a code revision to your site. 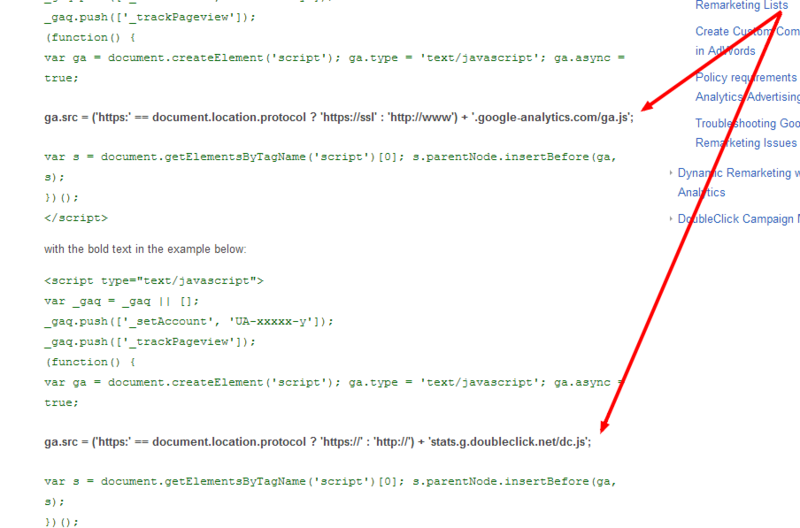 Fear not however, all you have to do to gain this access is swap out a line of code in your Google Analytics tracking snippet on each page of your site. Once you have done this you may now head back to the “Demographics Overview” screen we were looking at and click the “Validate Tracking” button I had pointed to. There is a down side, however. If you are just now integrating this, you are just now gathering this data. There is no retroactive data dump. If this is true for you then I suggest you let this data compile for a month, bookmark this post, tell all your friends about it, and THEN come back and scroll down. Depending on your site’s mediums of focus, you may also want to dig deeper into by-channel data such as PPC, Social, Organic, etc. Personally, the two segments of “persona-fiable” data I want to analyze are those who visit the site the most and those who transact/convert the most. This is going to allow me to analyze the persona of our most profitable site visitor as well as those who enter the site the most, and display how we need to cater more to the persona of those who enter the site the most so that they begin acting a little more like the most profitable group. Without too much confusion, I am going to use a sample Google Analytics profile to build out my separate personas. You will see that these two different types of site visitors have different intent as well as user experiences on the site. The first thing I want to do is look at the age groups of my visitors. I want to find the age group that visits my site the most. 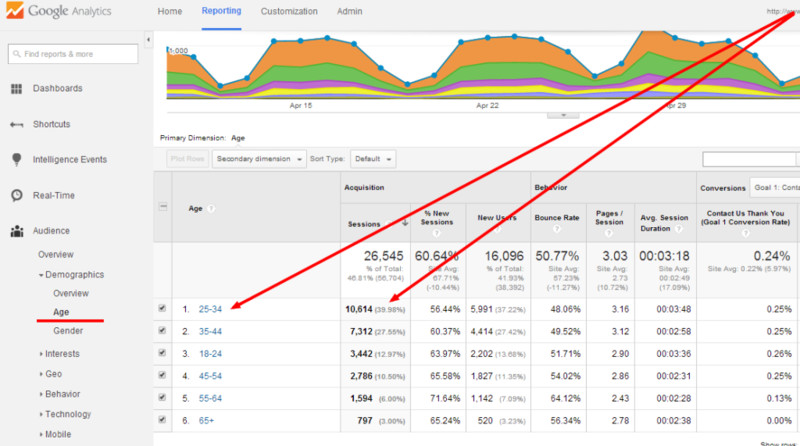 You can see that the 25-34 age group visits the site the most. Okay, for my second persona group I want to look at the age group that converts at the highest amount. Aha, interesting, the highest converting group is actually an older age group, 35-44. Now, you can begin to see that this segmentation is forcing these personas into different, unique directions. Now that I have defined ages I want to know more about gender. Clicking through each of my two age groups, I now want to segment gender proportioned by age group. 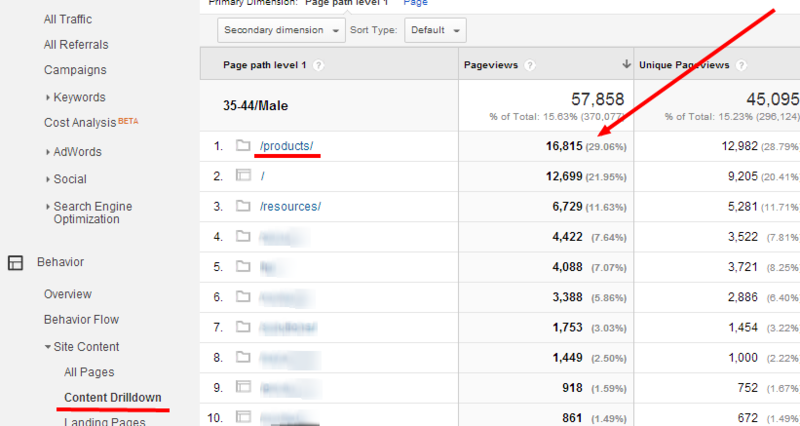 For both of the personas I am building, I noticed that 85% of my audience is male. DUH MOMENT: Even if you are finding a dominant gender that is grossly to one side, not to detract too far from your persona building, ask yourself why the other lacking gender is so low. Does the site speak clearly to the other audience? Is your site objectively built for one gender? Before you have the chance to look at by-country through partial persona information, you have to create a custom segment. What you will want to do is create a segment titled whatever your age/gender of focus is that you want to segment. Now that I have created custom segments by gender for my two age groups, I will use this as a traffic segmentation filter for the rest of this process. The next thing I want to do is take a quick look at users by country. One interesting item I found by doing this is that my top converters are primarily from the US but my typical site visitor is from India. 40% of my 25-34 age group is from India. DUH MOMENT: When looking at what country your traffic is predominately coming from, drill down into regions as well. Ask yourself if there are reasons why this may exist. Do you have an in-country location in this region or employees which you are not filtering out their traffic? Now that we have a feel for the age, gender and location of our digital personas, let’s take a look at how these types of visitors traverse the site. I want to look at my age/gender custom segment as well as the Organic segment to get a feel for how these groups are behaving on the site. Interestingly, the younger audience is landing on the homepage quite often, likely branded traffic, and is perusing pages such as the contact us, location, about us. This tells me that this type for persona is geared more towards learning about the company and potentially working for the company rather than buying from them. However, this is not going to dissuade me from dissecting this common path for introductions of popular content and calls to action. A further review shows that the pages speaking about the company have no other related content. Let’s inform this audience more on what we offer, as well as our resourceful content in the blog. What was found from converting 35-44 males from the US is that they are typically beginning their journey from the main products page before digging further into the site. While I could expound upon this User Flow section more and magnify the flow trails between pages, I want to look into the Content Drillldown and get a better feel for a few of the most popular content folders on the site, segmented by our personas of course. I have given a lot of attention in this piece to the typical user persona, but let’s take a look at the Content Drilldown of our converters persona. What we find is that most of these visitors are making a visit through the products folder. By clicking through the folder we see that these visitors begin to take journeys into separate product offerings. Continuing to walk down into further folders of content, we find that 25% of the original viewers visit a specific product and 25% choose to engage further with this product. Now, we can begin to take a walk through this site pathway and gain a better understanding of where we can make this funnel easier to follow. Without creating too much confusion, I also want to add information about our other offerings in this primary funnel. I want to enhance the performance of the funnel, but also try to cross-inform them of our other solutions. While I have a pretty good understanding of my personas’ user pathways through the site, I would like to define this a little more. I can look at the Reverse Goal Path to gain a better understanding of this persona and see the typical last three pages leading up to a goal conversion. This will help me much in the same way the data aided me above, to make the conversion funnel more fluid and ensure the best possible call to action placement. On the other hand, with my typical user persona, I want to learn a little more about where they are exiting the site. It would be wonderful if my typical user persona was a twin brother of the converter persona, but that just isn’t the case. For this review I will go back to my typical user segment and review Exit Pages. While some of our previous data analysis showed us typical user flow, I want to gain a better understanding of where they are exiting the site by segmentation of the typical user. I can understand the second, third and fourth pages in the list as they were in the previously reviewed funnels, but the first is the homepage. Am I doing the best job I can at providing introductions to the common pathways of a typical user on the homepage? There are enough areas and by-medium data points that we could look into that would turn this into a three day read. But, to add a little more insight into your digital persona dive, there are a few other areas i wanted to mention as you revise your digital strategy around personas. By taking a look at in-market segments by one of our persona segment filters, we can gain an understanding of what business categories these visitors fall into. Can we mold informational content around these industries? Can we begin using testimonials and case studies on site that surround these industry segments? Another similar area we want to view is Affinity categories. We learned above what probable business segments our persona groups belonged to, but it doesn’t hurt to tug at their after-work appeals also. If you can look at ways to tie in content pieces that coincide with these affinity categories, you just may appease your persona groups that much more. As you can see, we now know quite a bit more about certain traffic types that visit our site. What I still don’t know is some critical information on what these visitors truly want to find on the site. As mentioned at the beginning of our persona journey, we will also need to do some interviewing or focus group activity to fully understand our persona groups, but at least now we have a deep understanding of who these people are and how they are traversing our site.